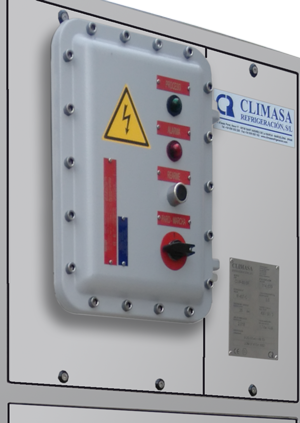 The CLW series are air handling equipment for hazardous areas. They usually are located in refineries and chemical industries. Suitable for zone 1 and 2. 3~ (380-420 50Hz / 440-480 60Hz) without neutral. Available powers from 2.6kW to 5.3 kW. Compact vertical structure easily mounted directly on wall. Weather resistant stainless steel AISI-304. Structure, covers and air system thermally insulated. Filters ATEX certified removable and easy to clean. Adjustable control thermostat with digital display. Control panel with monitoring and controls. External air conditioning with remote control panel. Input and output control signals. Liquid separator with heat exchange. Steam exchanger, control valve and electro-pneumatic actuator. Its compact design makes it usable in many situations without interfering with other facilities. The low-noise components are also installed with dampers and noise insulation, which makes it very quiet CLW series. The units are installed directly on the wall without air duct. The implementation is simple and user configurable.